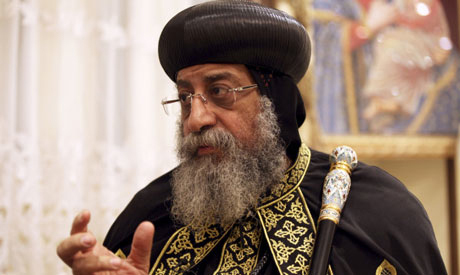 Egypt's Coptic Orthodox Pope Tawadros II held a meeting with Egyptian Christian public figures on Tuesday to discuss the ongoing row over Ethiopia's Grand Renaissance Dam project. The meeting, which took place at the St. Bishoy Monastery in Wadi Al-Natrun near the coastal city of Alexandria, was attended by representatives of Egypt's main churches, former tourism minister Mounir Fakhry Abdel-Nour and former presidential aide Samir Morcos. According to Al-Ahram's Arabic-language news website, meeting attendees discussed means of securing Egypt's share of Nile water, along with plans to raise the issue with the patriarch of the Ethiopian Coptic Orthodox Church. The latter is scheduled to arrive in Egypt on 17 June for a four-day visit. Ethiopia's Renaissance Dam project has been a source of concern for the Egyptian government, which fears that the project, if completed, could negatively impact the volume of Nile water reaching Egypt. In late May, Ethiopia began partially diverting the course of the Blue Nile – Egypt's chief source of water – in advance of the new dam's construction. Following the move, rumours circulated that the Egyptian presidency had requested the intervention of Pope Tawdros II to resolve the problem with Addis Ababa, given the traditionally close ties between Egypt's Coptic Orthodox Church and Ethiopia's Orthodox Tewahedo Church. The pope vehemently denied the reports at the time. In an effort to dispel fears regarding the dam's potential impact on downstream countries – namely Egypt and Sudan – Ethiopian officials have insisted the project would ultimately benefit all the riparian states. According to Egypt's National Planning Institute, Egypt will require an additional 21 billion cubic metres of water per year by 2050, on top of its current annual allotment of 55 billion cubic metres, to meet the needs of a projected population of 150 million. I don't understand why you people think damming the Blue Nile is Ethiopia's magic solution. Most of the river flows through uninhabitable low altitude canyonlands while in Ethiopia. The river is of little use for Ethiopia in regard to irrigation. The only benefit of the dam is electricity generation, and even that will not meet Ethiopia's growing demand. As an Ethiopian, I am disgusted by the comments showing complete disregard for the Egyptian people. While the Nile is primarily fed by the rivers of Ethiopia, Egypt has a a greater need for its waters. The Nile is Egypt's only source of water. Ethiopia has dozens of rivers and no need for the Blue Nile. You people are so eager to argue but have no understanding of Ethiopia's hydrology. GERD is a nonsense project that will only result in environmental destruction. Please correct the name of Ethiopian Orthdox Tewahedo Church,Not Ethiopian Choptic Chruch.Becouse you showed as that we dont have nothing in common over History We Dont have Coptic Church here. both egyptðiopia can use the nile river with out any problem . it is the gift of God.but in my opinion egyptians are always selfish. if nile flows from egypt to ethiopia they don't allow as to use even a drop of water. The nile river is very important to Ethiopia as it is for Egypt. why do people fail to understand this logic? Time for Egypt to deil with reallty,Because ETHIOPIA have 100% wright about Blue Nile river to do anything to use it or sale it. 1959 deil is not working for Ethiopia. Ethiopia is the second most populous nation in Africa after Nigeria. Ethiopians have God given right to utilize their own water for what ever they need to help their people. Egypt's position in this matter is careless and selfish. Ethiopia has the right to use its water resources as down stream countries do have. The solution is to discuss about the equity of the water resource to all upstream countries too. A country which is the source of 86% of the Nile, the living land of 92 million people and in 2050 jump to an estimated 278 million, how any logical and reasonable mind judges that an agreement( The amazing thing an agreement in the era of colonization)that is not participatory and not equity. Let me advice you :- you should accept equity and reasonable allocation of the resource. This is the only solution. Poor Egypt's coptics: They are so scared for dear life in a changing Egypt, they act like they have Ethiopia in their packet. Religion has very little to do with Ethiopia's relation with Egypt. We have both Muslims and Christians in Ethiopia. What Ethiopia expects Egypt to do is behave like a 21st Century state; not one that insists on bullying Ethiopia like the old days! It's that simple.